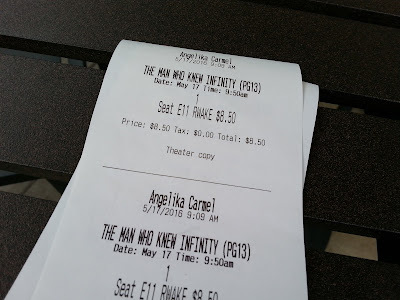 Movie: "The Man Who Knew Infinity"
An Indian peasant named Srinivasa Ramanujan (Dev Patel) with no formal education formulates great mathematical equations never before thought possible. He is invited to Cambridge by G.H. Hardy (Jeremy Irons) in order to eventually get his worked published. However, once there, he must overcome the racist and classist people who won't give him the time of day or take his ideas seriously. Written and directed by Matt Brown, "The Man Who Knew Infinity" is based on the true life story of mathematician Srinivasa Ramanujan, played by Dev Patel. Ramanujan is a little known historical figure, and very few people probably care about his existence unless they are math or science majors in college. Mathematicians in general don't exactly get a lot of notoriety, let alone someone who is known for developing a mathematical equation making it easier to calculate partitions. Just hearing this last sentence may have sent some of our readers packing already. Most people hardly know what mathematical partitions are let alone the people who made them easier to calculate. We know what many are thinking, math is boring, why would you watch a movie about a mathematician? Well, before you get cozied up and nod off to slumberland just thinking about calculus, there really are some interesting aspects to this man's story. 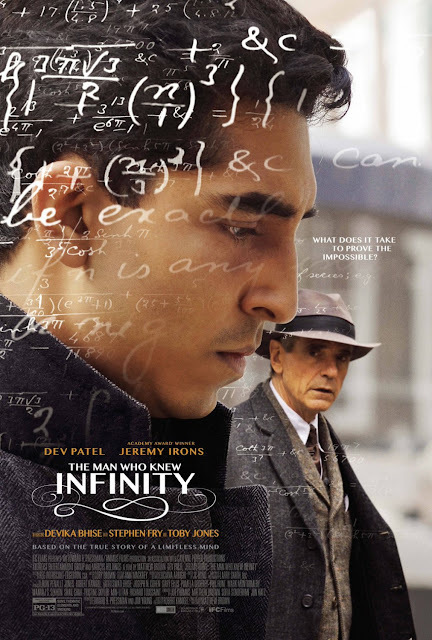 The most compelling thing about "The Man Who Knew Infinity" is the background where Ramanujan came from. As a man who grew up poor in Madras, India, it was extremely rare for those not well off to have a formal education. Because of this, Ramanujan was self-taught and had a difficult time trying to get accepted into universities. Most places turned him away because of his pauper status. He also had a hard time finding employment. Despite never being taught in a classroom, Ramanujan was able to develop some rather brilliant equations that got him a ticket to Trinity College at Cambridge, thanks to professor G.H. Hardy, played by Jeremy Irons. Ramanujan gave up a lot, including his wife who he left behind in India, all to pursue his dream and for the ability to tell the world of his equations, which he knew in his heart to be true. Once arriving at Trinity, his struggles were far from over. He regularly faced racism from both his professors and his peers, and he was looked down upon by most of the English aristocracy due to his peasant status. What's worse, he was an Indian peasant. The acting from both Dev Patel and Jeremy Irons is very exceedingly good in this movie. Patel continues to show just how excellent he can be. We cannot for the life of us understand why he doesn't get cast in more movies because we feel he is one of the best young actors around today. He plays Ramanujan as if it were second nature, and just based on his performance, we could tell he must have a massive respect for the genius he is portraying here. Jeremy Irons is also really compelling as the eccentric professor named Hardy, who wants to push Ramanujan to proof out his work, but winds up potentially causing a rift between the two of them with his assertive ways. Irons and Patel work brilliantly off of one another, though the script isn't quite strong enough to make them stand out as the best of the best acting for the year. Though there are some interesting elements to the overall story, this film does feel very slow. There were some points where we found ourselves bored with the length of it and also a little wary of its heavy-handedness. At the end of the day, there is a good amount of human drama and redemption for an unknown genius in "The Man Who Knew Infinity" to keep audiences engaged the majority of the time, so don't let its mathematical premise frighten you.